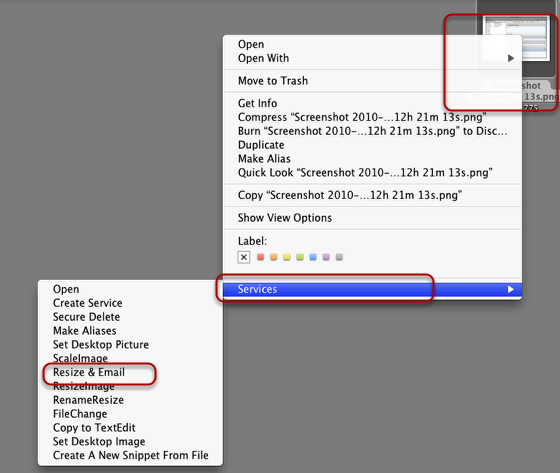 Hey you wanna-be Mac Power users, this article is a follow-up to Your Quick Guide To The Services Menu On Snow Leopard published on Monday. While Apple has improved its Services Menu in Snow Leopard, it’s not very useful unless you have items in it that you can use. 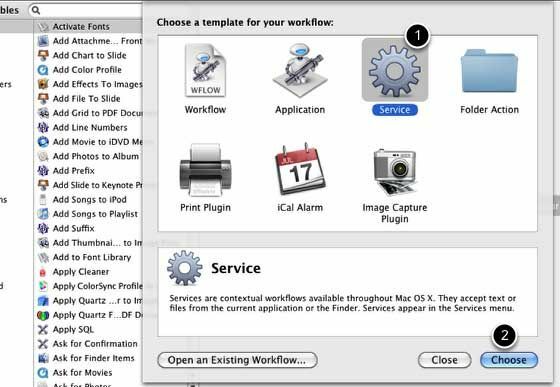 Some 3rd party applications will automatically include Services items, but the best use of Services is to custom build your own items, which can be done with Automator, a program installed with OS X Leopard and Snow Leopard. 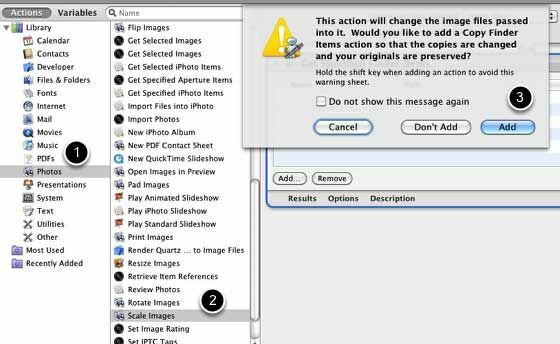 MUO published an article last year, How To Use Automator To Batch Rename Images on Mac about how to use a previous version of Automator. This how-to will show you how to use the newest version, incorporating the Services template to help you get started. The focus on this automation tutorial will show you how to create a Services menu item for the Mac that resizes a selected image on your Mac and attaches it to an email. 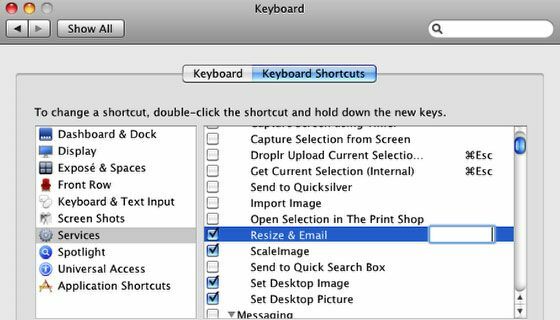 It works similar to emailing a photo directly from iPhoto, but with this Services hack, you can resize and email images from any application. Launch Automator, found in your applications folder. A drop-down window will appear with templates to help you get started. Select the Service template and click Choose. At the top of the workflow section, select “Image files” from the drop-down menu that appears next to the words, “Service receives selected.” Make sure “any application” is selected in the drop-down menu beside the first one. These selections tell when and where this Services item can be used. 1. 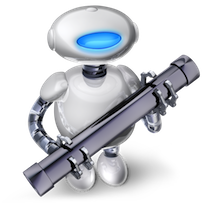 Now go to the Actions library of the first column of Automator. 2. Select Files & Folders. In the next column, select the action Get Specified Finder Items and drag it into the workflow pane. This action will grab your selected image on your computer. 1. Select Photos from the Actions library. 2. Select and add Scale Images to the workflow pane. 3. You will get a message asking if you want to make a copy of the original selected images before they are re-sized. Click Add if you want images copied. Click Don’t Add if you don’t want images copied. 4. This action includes a default size of 480px, but you can change to any default size you like. Also, you can check the “Show this action when the workflow runs,” which will allow you to also change the scale size before the the action re-sizes the selected image. 2. 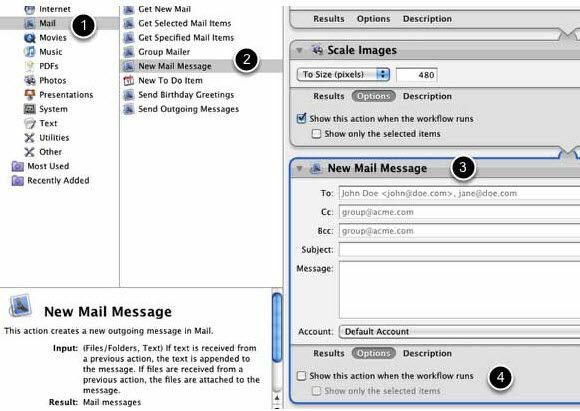 Select and add New Mail Message to the workflow pane. 3. Fill in any default information you like. If there’s a particular person that you always want to email photos to, include that person’s address. Same goes for the default subject and your selected account for email. On other hand you can leave all this information blank and fill it in as the Service action runs. 4. Clicking the box next “Show this action when the workflow runs” will enable you to add or change any information in the email before it is sent off. Save your workflow with a name that will help you remember what it is. You must save this action before it can run from the Services menu. If you need to make changes to the workflow, you can do so and just re-save it. It will be updated in the Services menu. Now right or control-click on an image that you want to resize and email. A contextual menu will appear and your new Services item should be listed in Services, at the bottom of the contextual menu. Click and let the automation run. It will re-size the selected image and attach to a new email message. If you think you’ll be using this Services item on a regular basis, you can add a keyboard shortcut that will run the action for you. Launch System preferences, select Keyboard, and then select Services. Locate the Services item you saved. Double click on the item and assign a keyboard shortcut. Be careful that you’re not assigning a shortcut that is already in use. That’s it. Now that you’ve created this Services item, you can create other useful ones, such as a similar workflow for sending and emailing selected text or documents. Simply see what actions are available in Automator and how they might be used for your particular needs. Macautomaton provides a few tutorials, as well as pre-developed Services items that you can download and install. I’m also developing a series of video tutorials on Vimeo that includes this and other automation tutorials. If you have any questions about this tutorial, ask it in the comment box. Let us also know how you’re using Automator in your Mac related computer work.